"You don't listen to me… you're gunna get hurt." Netflix has revealed a new full-length trailer for an action film titled Wheelman, about a "wheelman" getaway driver. We featured a teaser trailer for this last month, and here's the full trailer to follow that. Wheelman is told entirely from the perspective of the driver, with most shots inside the car, taking place over the course of one night and one bank robbery that goes terribly wrong. Frank Grillo plays the wheelman, co-starring Garret Dillahunt, Caitlin Carmichael, Wendy Moniz, and William Xifaras. This actually looks pretty damn good, and buzz from Fantastic Fest seems to indicate it might even exceed expectations. This really does look a lot like a grittier Baby Driver, though. You can still watch the first teaser trailer for Netflix's Wheelman here, to see a different take on this. 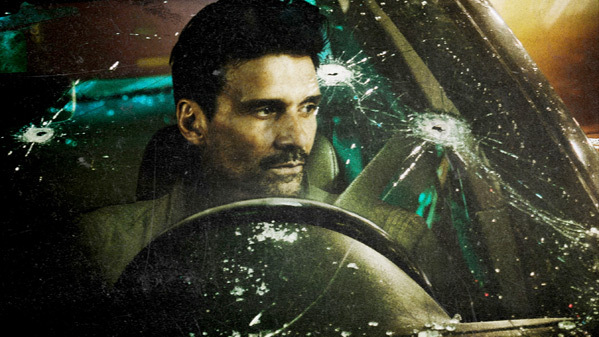 Frank Grillo stars as the wheelman, a getaway driver thrust into a high stakes race-to-survive after a bank robbery goes terribly wrong. With a car full of money and his family on the line, the clock is ticking to figure out who double-crossed him and the only person he can trust… his thirteen-year-old daughter. All reasons to think fast and drive faster. Wheelman is both written and directed by American filmmaker Jeremy Rush, making his feature directorial debut after a few short films previously. This film is produced by Frank Grillo, Joe Carnahan, and Myles Nestel. Jeremy Rush's Wheelman will be released on Netflix streaming exclusively starting October 20th this fall. Who's down for this? Any big fans of Frank Grillo?